The famous Tōshō-gū shrine in Nikkō, Japan, is home to a piece of art known by the entire world. A carving of the three wise monkeys has been proudly placed above the door of the shrine ever since the 17th century. Made by the sculptor Hidari Jingoro, the carving is a pictorial maxim of the phrase, “See no evil, hear no evil, speak no evil”. It is believed that the maxim came to Japan from China in the 8th century, as a part of a Tendai-Buddhist philosophy. In the middle school of this sect, they represent the three dogmas which symbolize a person’s life. The panel with the monkeys is only one small part of a bigger series of panels made at the shrine. The total of 8 panels represents the ‘Code of Conduct’ developed by the famous Chinese philosopher, Confucius. In the Analects of Confucius, a collection of sayings of the philosopher, a similar phrase exists. Somewhere between the 2nd and 4th century BC, the wording, “Look not at what is contrary to propriety; listen not to what is contrary to propriety; speak not what is contrary to propriety; make no movement which is contrary to propriety” was added to the collection. It is quite possible that this is the original phrase which was shortened upon its arrival to Japan. 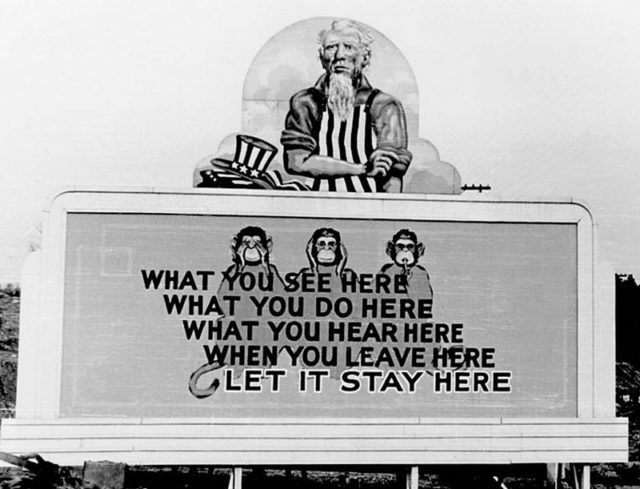 A World War II poster directed at participants in the Manhattan Project. The monkeys on the panel are Japanese macaques, a species which is common in the Land of the Rising Sun. 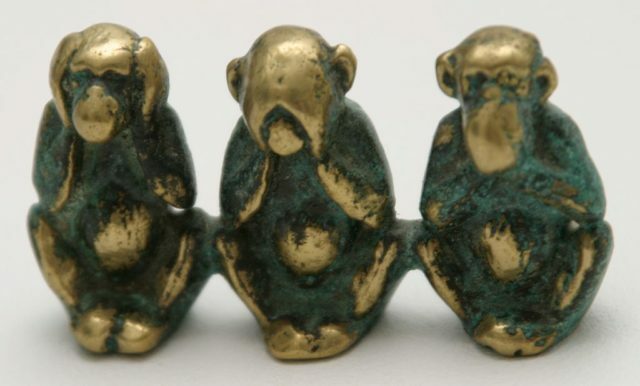 On the panel, the monkeys are sitting in a row, the first one has its ears covered, the second covers its mouth, and the third one is carved with covered eyes. The apes are widely known as the “see no evil, hear no evil, speak no evil,” but in reality, the monkeys have names. The one covering its ears is named Kikazaru; Iwazaru covers his mouth; and Mizaru covers his eyes. Besides their original Japanese names, the monkeys can be found under the names Mizaru, Mikazaru, and Mazaru in countries outside of Japan. The names are probably a play on words as they all end with the “zaru” verb. In the Japanese language, “saru” is the word used for a monkey, which sounds quite similar to the “zaru” verb. The second meaning of the word “saru” is go away, which can be interpreted as a phrase directed towards evil. Combined, in Japanese, they are called Sambiki-Saru, meaning, “The three mystic apes”. Sometimes, a fourth monkey is added to the famous trio. Named ‘Shizaru,’ the last monkey represents the principle of “do no evil”. It is a common belief that Shizaru was added much later by the souvenir industry, for commercial purposes only. 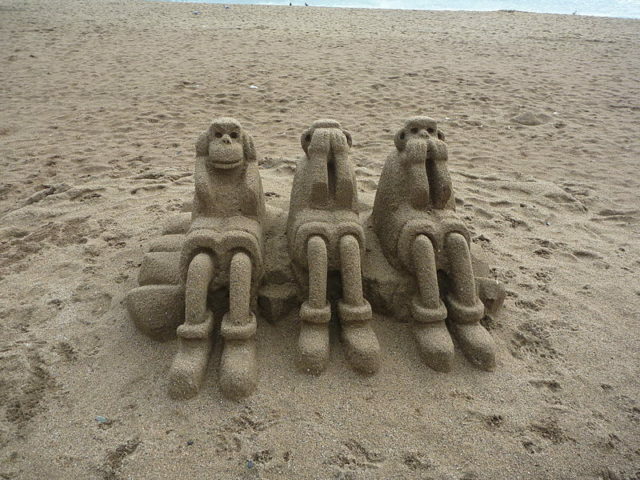 The monkeys represent an approach to life, supported by the Shinto and Koshin religions. Historians believe that the three monkeys symbol is approximately 500 years old, however, according to Osho Rajneesh, this symbolism was spread across Asia by Buddhist monks, having originated in the ancient Hindu tradition. Pictures of the monkeys can be seen on ancient Koshin scrolls, while the Tōshō-gū shrines, where the monkeys can be found, are erected as sacred buildings for the Shinto believers. Contrary to popular belief that the three monkeys originated from China, sculptures and paintings of the “see no evil, hear no evil, speak no evil” are hardly found in any other country besides Japan. The oldest items depicting the pictorial maxim are Koshin stone monuments and the aforementioned scrolls, which were used in religious ceremonies. The oldest Koshin monument with a monkey was built in 1559, but it has only one monkey, instead of three. The most famous depiction of the infamous monkeys is the one at the shrine in Nikko, which is today under the protection of UNESCO, proclaiming it as a World Heritage Site.